Identify indications for initiating osteoporosis treatment. List interventions in reducing fracture risk. List first line and second line osteoporosis therapy. Treatments for osteoporosis are effective at increasing bone density and reducing the risk of fracture.10 Bisphosphonates inhibit osteoclastic activity and decrease bone resorption. Denosumab is a humanized monoclonal antibody against the receptor activator of nuclear factor kappa-B ligand (RANKL) that reduces osteoclastogenesis and subsequently results in decreased bone resorption and increased bone density. Parathyroid hormone (PTH) is an anabolic agent. PTH stimulates maturation of osteoblasts resulting in new bone formation and bone remodeling. Multiple randomized control trials have demonstrated a reduction in the risk of fracture by 40-70% over a 4 year period with bisphosphonate therapy.11, 12 The greatest reduction is for those patients with lowest bone density or evidence of high bone turnover. Treatment may be indicated even if a person does not meet clinical or radiological criteria for osteoporosis as the goal of treatment is to reduce the risk of fractures. Initiation of medical therapy is based on future fracture risk and not purely a radiographic finding (see Geriatric Fast Facts: Osteoporosis Screening and Diagnosis). 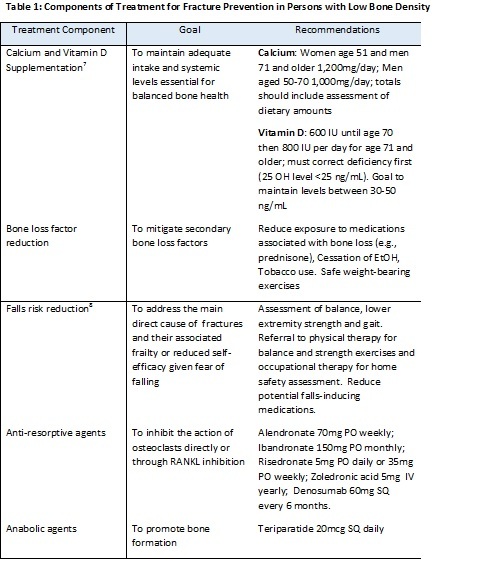 Treatment should include adequate calcium and vitamin D supplementation, mitigation of risk factors causing bone loss and reduction of fall risk (Table 1) as well as potentially other pharmacotherapy. Osteopenia (T-score -1.0 to -2.4) and 10-year probability of hip fracture >3 percent or major osteoporosis-related fracture >20 percent based on the WHO FRAX calculator (https://www.shef.ac.uk/FRAX/tool.jsp). Denosumab (a RANKL inhibitor) is not considered as initial therapy for most patients with osteoporosis though it may be appropriate for patients at high risk for fracture who have a contraindication to, or unresponsiveness towards, bisphosphonates, or those patients whose GFR < 35mL/min/1.73m2. This medication is administered every 6 months by subcutaneous injection. The side effects are similar to bisphosphonates and include the risk of atypical fractures and osteosarcoma. Risk of infections, including skin, abdominal, lung, and urinary system are slightly more common (4%) and if developed while on therapy are a reason for discontinuation of any future treatments. Teriparatide is an anabolic agent stimulating bone formation through activation of bone remodeling. This medication is not considered initial therapy for most patients and is reserved for those who have severe osteoporosis (T-score of -3.5 or below even in the absence of fractures, or T-score of -2.5 or below plus a fragility fracture), have a contraindication to bisphosphonates, or failed other osteoporosis therapies. Treatment requires daily subcutaneous injections. Side effects may include bone pain, injection site irritation, and hypercalcemia. Rare risks include osteosarcoma. Treatment duration is two years.